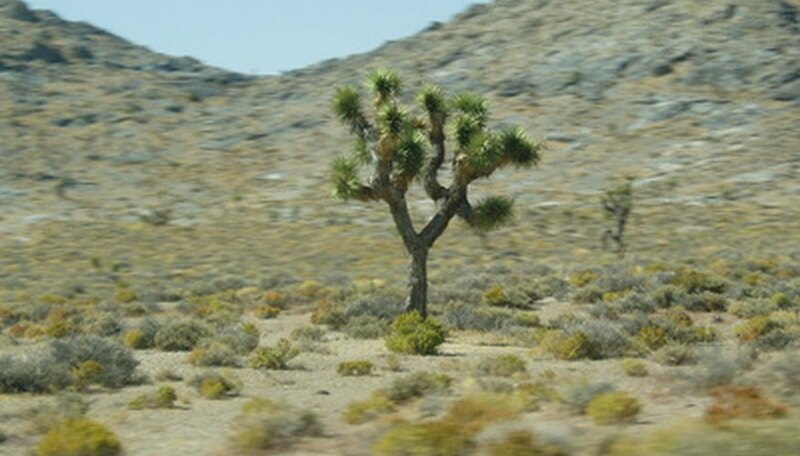 The Joshua tree (Yucca brevifolia) is a slow growing member of the Agave family, eventually reaching heights of from 15 to 40 feet, with a root system that can extend up to 35 feet from the plant. Endemic to the Mojave desert, the Joshua has only one pollinator: the Pronuda or yucca moth. If pollinated, the tree will bloom in the summer and will drop its seeds in the fall, which is when you should collect them. Grab a pot full of soil while you are there as the Joshua tree prefers native soil. Start your seeds in early April. Pour the soil into the pot, to 2 inches below the rim, and water it until the excess water runs out of the bottom of the pot. After it drains, water it again. Place the seed on the surface of the soil and sprinkle 1/4 inch of soil over it. Place the pot in a sunny area that remains over 60 degrees F. Keep the soil most at all times by misting it with a misting bottle. You can also set the pot in a shallow tray filled halfway with water. Transplant the seedling into a one gallon pot, using native soil if possible, when it reaches a height of 2 inches. Place the newly transplanted seedling in an area that receives indirect sunlight and remains 85 degrees F.
Transplant into the yard when the sapling reaches 10 inches in height. Choose a sunny location. Water until the water puddles at the base of the Joshua tree and continue to water in this manner every week for the tree's first year. The Joshua tree will resemble a tall blade of grass during its first year. This is because it is spending its energy on producing a large tap root.